Got a hole or crack in the wall? Fill it with LEGOS! I love all things clever and amusing, so this really made me smile today. 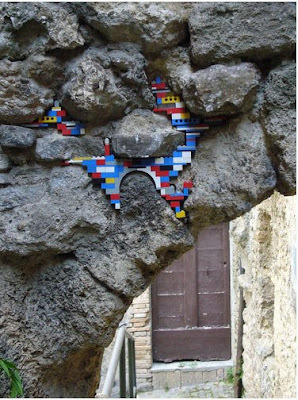 The Lego wall repairs by Jan Vormann are not only playful pieces of art, but also creatively mix old and new building materials (or toys in this case?). How great would it be to stumble upon this during an afternoon walk? This is hilarious! I love, love totally random things like this. Brilliant! Let go of my lego. That is a very clever way of using the childhood toy. Maybe he loved them so much as a kid, that was a solution for a whole in the rocks. It if really something. Those are awesome! 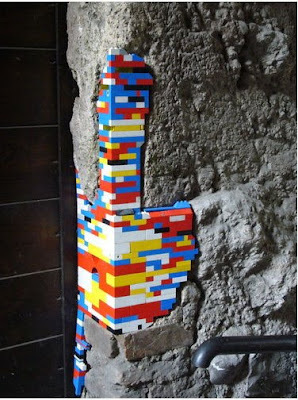 Legos ROCK! I know RIGHT?! So clever...I love it. Wish people would do this in my city! This is great! I'm going to forward the photos to my nephews. They have both worked at a lego store for their young adult lives. They even started a lego club at college. This made me smile too! Thanks for sharing. Love this with my whole heart! I am going to grab my legos and go hunting for holes! oh my heart smiled when i saw this! talk about clever. now only if it would work in drywall. hmm. pretty sure it wouldn't look as cool. thanks for sharing this clever find! HAHAHA! 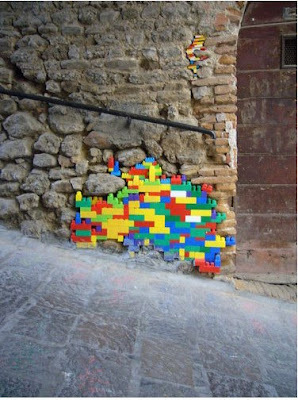 How wonderful would it be to stumble upon a lego repair in some decrepit urban neighborhood? What a fantastic and inspired idea. Love it! Wow, I really love this. Who would've thought to add Legos? oh YEAH! This is so great. People are SO clever!! I fall in love with the human race all over again when I see things like this. 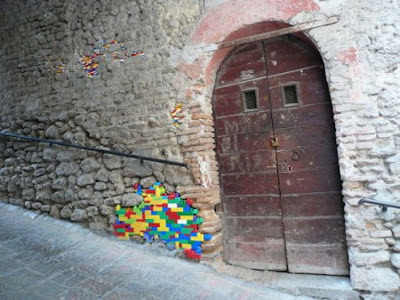 So that's what we do with all those boxes of legos that my boys played with! Big smile, thank you for sharing! gasp! i love this idea! and your two fun posts today. These are really fun! Who thinks of these things?! I love this idea! I want to give a big squishy hug to the person who thought of doing this! Hope this trend takes off in my city! Oh my goodness! This made me laugh! Very clever. My father and my kids thought this wild! My kids have bins on top of bins of the things. Now I know what I can do with them when I'm not removing the small pieces from the heel of my foot! this makes the little kid in me so very happy! this is too cute. i love the idea. i love your blog. i am glad that i found it. those are pretty darn awesome, to say the least. I love this so much. Thank you for sharing it. This is the sort of art installations that stay in my mind for days... I love it! I just caught this through the Kindred-Design blog :) Too cool! Thank you for taking the time to comment. Even if I don't get a chance to respond please know that I read and appreciate your thoughts. Every comment counts!